An exciting crowd waiting for the gates to open. It was the night where the spirits of lending a hand and assistance flew around. Samudra Gupta, one of the leading poets and lyricist of the country is suffering from cancer and the crowd stands awaiting, to let him know that they are by his side. As the gates open and the crowd flurries in, the program organizers, Scholars Publisher and Shangbrita, put final additions on the set up for the program. 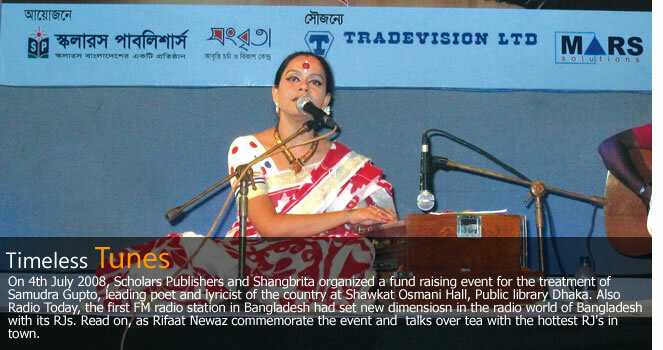 Shimul Mustafa, one of the leading orators of the poetry world of Bangladesh informally voiced a piece to set the mood for the upcoming performance. The program was inaugurated with a welcome message from celebrated actor Assaduzzaman Noor and the raisings from the sales of tickets of the program being handed over to the family of Samudra Gupta by the living legend Nirmalendu Gun. While the lights dimmed and the reverberations of the applause of the audience faded away, the stage reminded me of 'Krishnopokkhe Adh Khana Chand' - the title of the program. The festive atmosphere was all there, but something overhung the program, a sorrow, a pain that showed on all the faces, peeking out at the mention of a name, 'Samudra'. The program started with an ensemble of instruments like Harmonium, Acoustic Guitar, Flute, Violin, Keyboard and Tabla playing along with a blend of Oration and classical singing. The performers of the program, orator Mahidul Islam and talented singer Dilara Khan Rupa vibrated through the jam packed auditorium in pin drop silence which was only occasionally perturbed by the applause of the audience at the end of each performances. The follow up by the instrumentalists were marvellous as they adapted to each of the changes in atmosphere and the combination of flute and violin playing was a remarkable sight. Famous poetry by Rabindranath Tagore, Najim Hekmat and popular classical based songs like 'tumi nirmal koro mangal kore', 'ami shunachi shedin tumi' made the audience feel a smooth yet strong moral awakening.